Invite your girl friends to a Flip Flop Party. This is a great themed party for little and grown up girls. 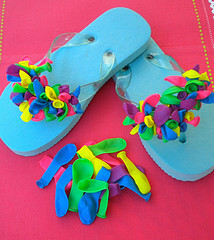 Design and decorate your own flip flops, give pedicures, or give prizes to those who come wearing the coolest flip flops. Here are some ideas for a great party with these flip flop party supplies. From invites to party bags, your themed party will bring lots of fun and laughter. So get a bunch of girl friends together to celebrate - whether it's a birthday party or a fun reason for a girl's night out. 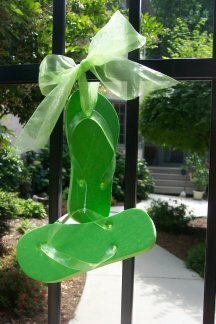 It's is easy to find flip flop invites, napkins, flip flop string lights and all kinds of flip flop decor. Use flip flop wine glass charms to identify someone's wine glass and flip flop decorated party bags for the party favors. Flip Flop invitations set the tone and theme for your pool or Flip Flop Party. So colorful and cute, you can find some great designs and colors. For my Flip Flop Party I added a note on the invite for guests to wear their favorite flip flops for a flip flop contest with prizes. Use these colorful paper plates with solid colored napkins and tablecloth. Flip flop wine charms carry the party theme to your drinks. Guests can easily identify their drink with these colorful charms. I love these flip flop shaped party bags - and they are a great bargain too. You get 12 of them for $12.00. Pedicure sets from the Dollar store or from Amazon like the one pictured, make great take home party favors reminding your guests of some great girl time. Set out a Flip Flop Garden Flag or a flip flop stepping stone to welcome your guests. Consider using decorative flip flop plastic plates and insulated tumblers instead of paper products so you can use them over and over. 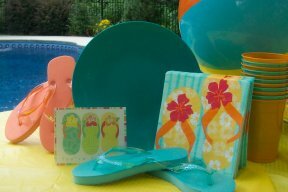 Flip Flop decor sets a fun and summertime tone and theme to your pool party. Use plastic plates and insulated tumblers rather than disposable paper products. 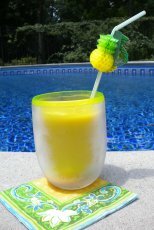 Flip flop themed insulated Tervis tumblers carry the theme for entertaining teens and adults. My favorite flip flop decorations for a Flip Flop Party? What else... flip flops! I buy brightly colored flip flops from the Dollar Store and matching ribbon. 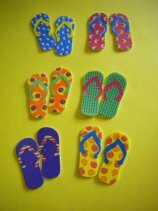 Use them in different places to carry out your flip flop theme. Lime green flip flops were tied onto our pool gate door to greet our pool guests. Select a color scheme using 2-3 colors and repeat these colors in the paper goods, tablecloth and decorations, like paper lanterns. 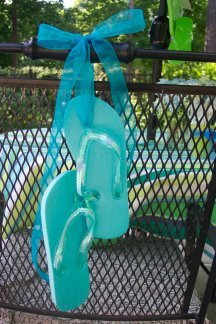 Although I often use flip flop plates and napkins, this time I used solid color party supplies and hung pretty flip flops with matching ribbon on the pool gate, on the patio umbrella pole and even on the chairs. 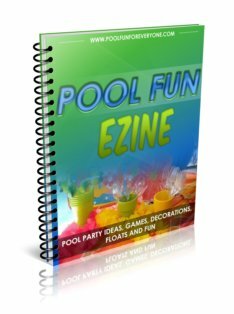 Flip Flop decor sets a fun and summer time tone and theme to your pool party. Set a Flip Flop Garden Flag or a Flip Flop stepping stone at the entrance to your pool to welcome your guests. Use plastic plates and insulated tumblers rather than disposable paper products. Flip flop wine glass charms or flip flop wine glasses with a flip flop ice bucket carry the theme for entertaining adults. Thanks to their popularity, it is easy to find many fun, colorful and inexpensive Flip Flop party serving pieces like trays, spreaders, swizzle sticks, and coasters. Don't forget to decorate the pool! I couldn't resist these cute flip flop floats - of course I couldn't get just one. Have them floating in the pool when the guests arrive for your Flip Flop party. Or have one propped up against the pool fence near the pool gate where the guests enter the pool. Have two flip flop mattresses floating in the pool when guests arrive. Or use them standing upright at the entrance to the pool or party area. I love this Flip Flop Party Flag for greeting your guests. Flags are colorful and large enough to make a statement. Place the flag at the entrance to your pool or party area with some colorful balloons to help identify the "party house". These garden flags are great flip flop party decorations. Isn't this just the cutest sign? Hang this sign on the pool gate and everyone will start to relax as soon as they enter the party oasis. I love the bright colors and the rustic look for a sign that can be enjoyed long after the party has ended. What I love about this flip flop balloon is that it is BIG - 33". 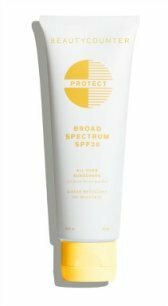 You really get a big impact for a small investment of $7. This large pair of flip flops just screams let's have some flip flop fun. Use them by themselves or add some solid color balloons for a balloon centerpiece. Place them on the party table or by the pool entrance. These colorful inflatables measure 11". They come as a set of 3 in assorted colors and styles. You can't pick your color or design. There are so many ways to use them - set them on the party tables for centerpieces or use them for games. Like musical chairs - pass the flip flop around and when the music stops that person is out. Use them for swim races - each player has to swim the length of the pool with one of these flip flops on their hand or on their foot. And then pass it on to the next team player. Flip flop lights are the perfect pool decorations for your Flip Flop Party, Pool Party or Beach Party. Use flip flop candles, string lights or flip flop votive holders to carry out your flip flop party theme. These flip flop outdoor string lights add color and flair to any outdoor pool party. They are made out of inexpensive plastic (what do you expect for under $8?) - and you will need a couple of strings of them depending on where you plan to hang them. String them around your deck railing, the pool fence or on a garden trellis. You will probably need some extension cords. Each Flip Flop Outdoor String Lights is 8 feet and the flip flops are small at 3". 1. Buy the flip flop cookie cutter and make flip flop sugar cookies ahead of time. Have your guests decorate the cookies with colored frosting, sprinkles and candies. 2. Buy inexpensive flip flops from one of the dollar stores and decorate them with ribbon, rick rack, fabric , and silk flowers. The ones in the picture were simply decorated with colorful balloons. 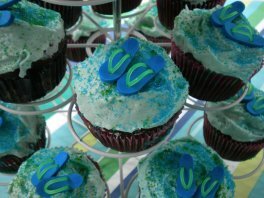 No party is complete without dessert and a flip flop cake ( or cupcake)is sure to be the highlight of your menu. I prefer cakes that are easy to make, but make a big statement. In fact I find that when kids are involved, cup cakes are a big hit and easier for them to handle. Simply buy and place these cute mini flip-flop erasers on the the cupcakes and serve them on a cup cake stand. The frosting was tinted blue and then sprinkled with blue and green sugar. A Flip Flop cake is the perfect dessert for your pool or flip flop party. You can have so much fun with this - and if you want it can also serve as your centerpiece. This cake picture is from Terrisstuff64. 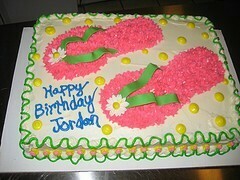 Color some coconut, position the coconut on your round or 9 x 12 cake, in the shape of a flip flop. Add some ribbon and a silk flower. I used this flip flop game as an ice-breaker for our neighborhood girls night out Flip Flop Party. After everyone had arrived each guest was given one flip flop sticker. They were instructed to find the person who had the matching flip flop and then share with them your favorite summer vacation. Everyone loved the chance to talk to someone they perhaps had not met and it was a nice way for our new neighbors to get connected.